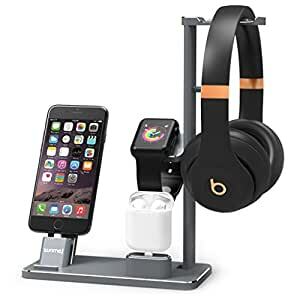 6 in 1 APPLE WATCH STAND: Original designed by XUNMEJ (Patented Product), this Apple Watch charging stand is specially designed to charge Apple Watch series 3/ series 2, Airpods, iPhone or iPad Mini and hold both over-ear and in-ear headphones all in one place. Basically meet all your expectations about what a charging stand can do. NOTE: ALL Cables are NOT included. A DELICATE DECORATION TO ARRANGE CABLES: The smooth line and modernist design of this iWatch stand made it an exquisite artwork for your table, nightstand and your bedroom. This Apple watch station can keep your table clean and neat cause all wire channels are well concealed at the bottom of it. No more tangling cables to bother you. MULTIFUNCTIONAL AND PRACTICAL: Additional headphones holder can store your over-ear headphones, in-ear earbuds, as well as your jewelry as earrings, bracelets and necklaces. Made of solidly built aluminum, this heavy-duty iPhone charging stand can charges your Apple devices quickly and safely since anti-scratch pad were covered on all the surface which touch your devices or table. A SIMPLE STATION TO MAKES LIFE EASIER: There are an adjustable screw on the back of the iPhone stand to fit case thickness within 45mm which means you donât need to take your case off to charge. A little protrusion before the iPhone mount can hold your phone for a variety of entertainments. It is so convenient to put all electronic products in one single stand, including a pair of heavy headphones. COMPATIBILITY: This apple watch charger dock is designed for Apple Watch Series 3/ 2/ 1/ Nike+ / Sport / Edition (38mm / 42mm); Apple Airpods, iPhone 8/ 8 Plus, iPhone X, iPhone7 / 7 Plus, iPhone 6 / 6s Plus, iPhone SE/ 5s/ 5c, iPad Air, iPad Mini and all kinds off headphones ect. 100% satisfaction guarantee, please feel free to contact us with any problem, our After-sales Service Team is at your service.